REGULAR READERS know that I’ve been following the work of the uniquely brilliant biomedical gerontologist, Dr. Aubrey deGrey, the founder of the SENS Research Foundation, dedicated to understanding why we age, thereby freeing us from age-related diseases. Aging begins before birth and happens as a side effect of metabolism, Aubrey claims. Metabolism causes damage, but the damage is relatively minor for much of our lives until it accumulates sufficiently to manifest as some pathology (the scientific study of the nature of disease and its causes, processes, development, and consequences). 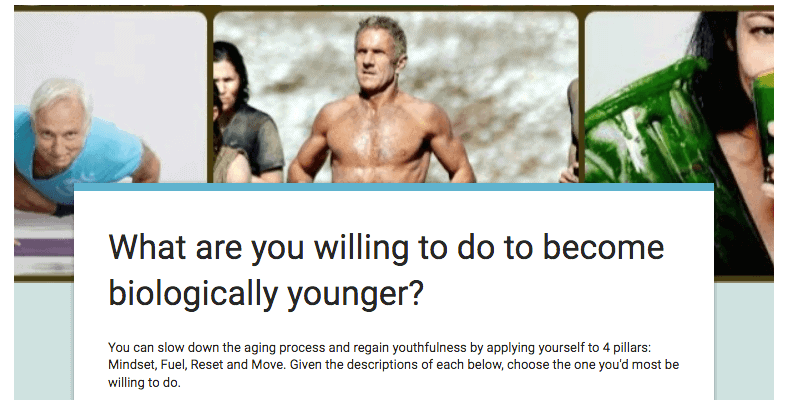 .In large part, today’s material that I present for your edification comes from the SENS website and a long, smart interview about why we age that Dan Pardi, founder of Dan’s Plan, conducts with Dr. deGrey. 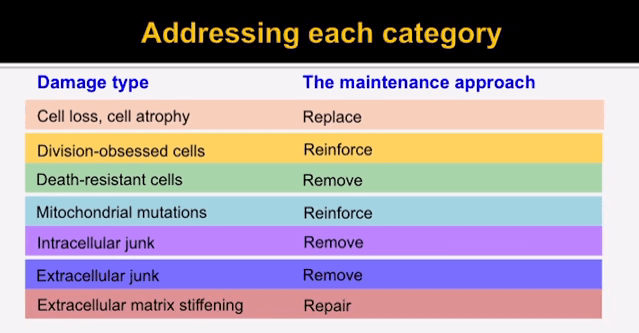 Three that relate to cells, including replacing lost cells and reviving/replacing cells that are atrophied. Removing cells that just won’t die, but need to. The mitochondrial mutation technologies that might help our mitochondria remain functional longer. How the accumulation of intracellular junk ultimately leads to things like macular degeneration (the leading cause of blindness in humans), and oxidized LDL (bad cholesterol), which causes some major forms of heart disease. How our immune system and vaccination technologies can be made to remove extracellular junk. Lastly, we glean some understanding about how to reduce extracellular crosslinks that mess with our proteins in a way that makes us wrinkled and incapacitated. 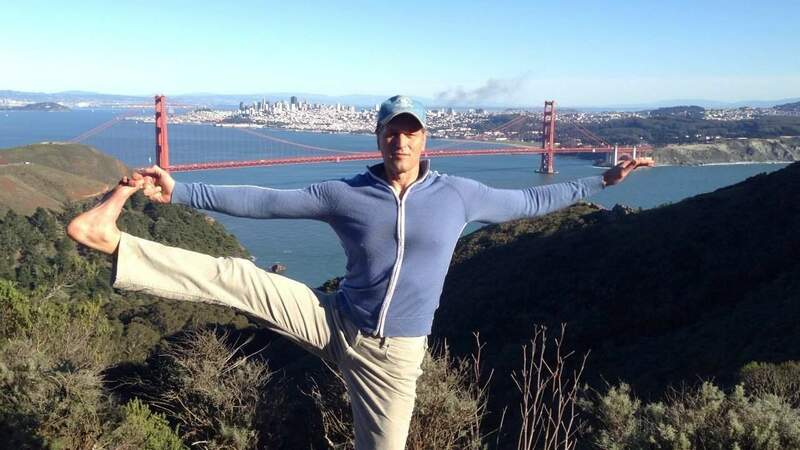 Dr. deGrey often compares the human body to a vehicle. Vintage cars can be more than 100 years old even though they were not designed to last that long. Nevertheless, they can stay intact and perform decades longer than intended because of the comprehensive maintenance, repair and parts replacement that their owners do. In the case of the human body, the damage associated with aging is often self-inflicted as the consequence of its normal operation, and that damage accumulates and eventually exceeds what’s tolerable, and eventually it – the body – no longer works. 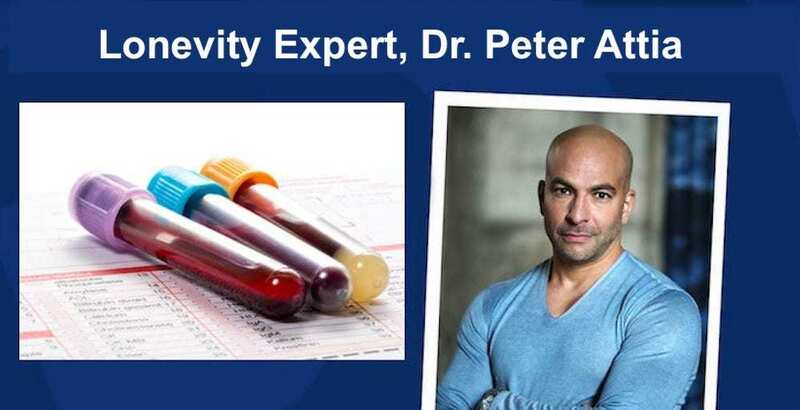 Generally speaking, the “damage” Dr. deGrey refers to concerns all aspects of the structure and composition of the body at the molecular or cellular level that progressively degrades throughout life as a side effect of the body’s normal metabolism. Once there’s too much degradation, it contributes to the various ills associated with old age, such as the loss of mental or physical performance. The usefulness of the car analogy is to understand that there’s much we can do to maintain and repair our bodies over time, just like those auto hobbyist do with their vintage cars. Before we get into the Dan Pardi’s interview of deGrey, I want to show you a few images from my article, 7 Ways Science Will Repair the Damage of Old Age, to make all this a bit more relevant to you. As you would expect, the intervention fits the situation. To make this potentially relevant to you, consider the “damage type” behind two of the most fearsome diseases just ahead of us as we age, heart disease and Alzheimer’s. Well, I guess something’s gotta kill you eventually, but my worry is not death per se, but a very compromised life, like having some sort of heart disease dramatically diminishing one’s joie de vivre. Which brings me to a study write-up called, Aging of the United States Population: Impact on Heart Failure, that puts the incidence of all CVD in the U.S. at 37% of the population in 2010, and estimates that it will grow to be 40.5% by 2030. (See this table.) These stats are probably similar across the industrialized world. I bring this heart stuff up to underscore the value of categorizing the deterioration that is aging the way Dr. deGrey does it. As you’ll see as you read on, the interventions underway that address deGrey’s seven categories will potentially be useful not only to diseases like CVD and Alzheimer’s but also Parkinson’s, ALS/muscular atrophy, neurodegenerative diseases and a host of others Dr. deGrey touches on in the interview. As you can see in the image below, four of Dr. deGrey’s seven categories contribute to heart disease; thereby, interventions to prevent or mitigate this damage will also diminish the incidence of CVD. Among my circle of friends, Alzheimer’s a greater worry than CVD. This is not because these people eat right and are fitness buffs, and thus need not worry about heart disease. No, the reason people are more worried about getting Alzheimer’s than heart disease is because it attacks the essence of who we are – our minds. One to four family members act as caregivers for each individual with Alzheimer’s disease, which means – at minimum – one-quarter of families are affected by Alzheimer’s one way (you have it) or another (you care for someone who does). It’s an understatement to say that Alzheimer’s is a problem, which is why it’s important to understand how this disease happens and what are the likely interventions. Although Dr. deGrey has classified the damage coincident with aging into seven major categories, this does not reflect his view that there are only seven mechanisms or processes that account for why we age, but rather that his particular bundle of seven lend themselves to specific interventions. For each of deGrey’s categories there is a corresponding generic intervention and approach that may differ in detail from one example within the category to another, but only in detail; the basic thing is the same, he says. For more on this, be sure to click on the “SENS solution” link under each of the following seven categories of aging. Now, let’s dig into Dr. deGrey’s work and insights about why we age. Every day, our cells are damaged by both tiny molecular-level insults and by obvious trauma. Some of these damaged cells are repaired, but others are either destroyed, or forced into a dysfunctional ‘senescent’ state where they can no longer divide, or commit ‘cellular suicide’ (apoptosis) for the greater good of the body. The pools of specialized, tissue-specific stem cells replace some of the lost cells, but the degenerative aging process makes these stem cell pools less effective at repair over time. The net result is that over the course of many decades, long-lived tissues like your brain, heart, and skeletal muscles begin to progressively lose cells, and their function becomes increasingly compromised. Muscles weaken, and don’t respond properly to exercise or injury. The brain loses neurons, contributing to cognitive decline and dementia, as well as to loss of control over fine muscle movements (a process that ends in Parkinson’s disease). The thymus – the gland in your breastbone where a major class of immune cells mature – shrinks, leaving you more vulnerable to infectious disease as fewer fresh immune cells are produced. Everybody knows how we fix that already. That’s the best known one, the furthest developed one as well, namely stem cells. That’s what stem cell therapy is. We program cells in the laboratory into a stage where we can inject them into the body and then when they get there they will divide and transmogrify into cells that will replace the ones that the body is not replacing on its own, that’s all that stem cell therapy is. 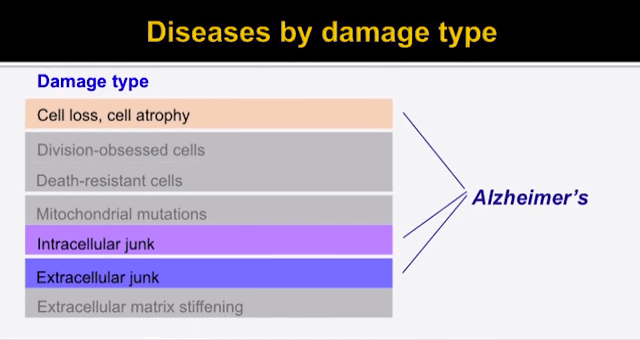 Two types of damage accumulate in our genes as we age: mutations and epimutations. Mutations are damage to the DNA sequence itself, whereas epimutations are damage to the “scaffolding” of that DNA, which controls how and when genes get turned on in the cell. For practical purposes, both mutations and epimutations ultimately harm us in the same way: by causing abnormal gene expression, whether it’s by increasing or decreasing the amount of a protein encoded by a gene being produced, by altering in the conditions under which that production is activated, or by altering the structure and function of the ensuing protein itself. Because of their similar effects, an approach that prevents the negative consequences of these changes in gene expression can be used to make both kinds of damage harmless, despite the fact that the molecular basis of mutations and epimutations are quite different. So what kind of harm can the changes in gene expression resulting from (epi)mutations cause? The one that most people know about is cancer, which is the result of a series of (epi)mutations that happen in sequence in the cell, leading to its uncontrolled growth. Other kinds of (epi)mutations also occur in our cells over time, and some scientists have worried that these non-cancer-causing (epi)mutations might also contribute in different ways to age-related disease and disability. But there is good reason to believe that there aren’t enough such mutations to actually have a meaningful impact on our health. This is because the threat of cancer from even a single (epi)mutation is so great that it forces the body to develop defenses against (epi)mutations that far exceed what would be needed to prevent a meaningful burden of non-cancer (epi)mutations from occurring. What’s the next type of damage? 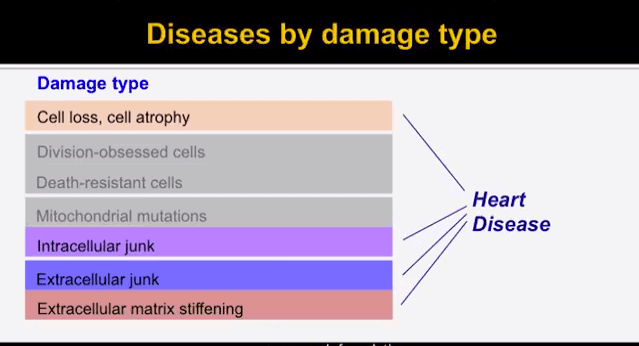 The next type of damage is having too many cells because they are dividing when they’re not supposed to. Of course that is cancer, that’s pretty much the definition of cancer. There are loads and loads of ideas out there to what to do about cancer and we haven’t had much success over the years. Things are looking very rosy right now as compared to the past, even as little as five years ago, because of very smart and ingenious advances in a field called cancer immunotherapy where people are figuring out how to tip the balance of the arms race that exists naturally in the body between the ingenuity of the cancer and the ingenuity of the immune system. I am fairly optimistic that that will lead to pretty down to comprehensive treatment of cancer fairly soon. Cancer immunotherapy has caught on. Right now, a dear friend of my sister’s who has brain and lung cancer is about to be entered into a trail that uses this therapy. Cancer immunotherapy is a type of cancer treatment designed to boost the body’s natural defenses (immune system) to fight the cancer. It uses substances either made by the body or in a laboratory to improve or restore immune system function. The trick that scientists are trying to figure out is how to tip the balance between the ingenuity of the cancer and the ingenuity of the immune system. Our cells have built-in programming that sometimes veers them far away from their normal fate. Some of this programming watches out for conditions emerging within the cell that could put the rest of the body at risk; similar systems exist because the body no longer has need for the function that the cell normally fulfills. Pushing these cells to undergo such transformations is favored by evolution because it meets short-term needs, and having a few of these abnormal cells in the body for is nearly harmless. But the number of these cells in our tissues gradually rises over time, until by our fifth decade or so they begin to reach levels that are harmful to normal tissue function. Category number three is also an aspect of having too many cells. You must think that’s very odd. Why would I split that description into two categories? The answer, it goes back to my explanation of why I have these seven categories at all namely it’s all about the intervention. The other type of way in which you can have too many cells is if cells don’t die when they are supposed to. First of all one might think that’s actually pretty strange. Most people overlook that kind of category because they think, “I’m sure cells are never meant to die.” That turns out not to be true. The immune system is a fine example of a case where it’s absolutely vital that cells should die after they had done their job in order to make room for other cells. This process is impeded, it impairs in late life. Dr. deGrey puts too many cells, or “Death-Resistant Cells”, into a separate category due to the distinction between having too many cells that are dividing when they shouldn’t versus having too many cells hanging around because they refuse to die when they should. The likely approach, he says, is called “Suicide Gene Therapy”, already a routine procedure in laboratories, but not yet a clinical therapy to eliminate these over abundant cells that don’t want to die when they should. Whereas the first three categories covered above are about the number of cells we have, this one deals with what happens within cells. Mitochondria are the living machines within cells that act as their “power plants,” converting the energy-rich nutrients in our food into ATP, the form of energy that directly powers biochemical reactions in the cell. Unlike any other part of the cell, mitochondria have their own DNA (mtDNA), separate from the DNA in the cell’s nucleus, where all the rest of our genes are kept. Just like real power plants, mitochondria generate toxic waste products in the process of “burning” food energy as fuel – in this case, spewing out highly reactive molecules called free radicals, which can damage cellular structures. And the mtDNA is especially vulnerable to these free radicals, because it is located so close to the center of its production. At worst, a free radical “hit” to the mtDNA can cause major deletions in its genetic code, eliminating the mitochondria’s ability to use the instructions to make proteins that are critical components of their energy-generating system. Lacking the components needed to produce cellular energy the normal way, these mutant mitochondria enter into an abnormal metabolic state to keep going — a state that produces little energy, while generating large amounts of waste that the cell is not equipped to metabolize. Perversely, the cell tends to hang onto these defective, mutant mitochondria, while sending normal ones to the recycling center, so if just one mitochondrion suffers a deletion; its progeny quickly take over the entire cell. Although this happens to just a few cells in our body, those few cells wind up doing disproportionate damage to the body as a whole, because they dump the waste that their mutant mitochondria generate into the circulation, poisoning their environment by causing oxidative stress to rise all over the body. … now I can move from the three categories that are all about the number of cells we have to the categories that are more at the molecular level. There are two categories that are to do with stuff that goes on inside cells. Then after that I deal with the steps that go in the spaces between cells. Within cells, the first major category is mitochondrial mutations. Mitochondrion is this very important part of the cell that does basically the chemistry of breathing and combining of oxygen with nutrients to extract energy for our nutrients. The weird thing about mitochondrion is it has its own DNA. It’s the only part of the cell that does. It doesn’t have as much DNA, only 13 proteins are enclosed in it, but those 13 proteins are essential and it’s rather important to make sure that those 13 proteins continue to be appropriately synthesized throughout life. Turns out unfortunately that mitochondrial DNA accumulates mutations vastly more rapidly than the nuclear DNA which means of course that it’s got a much greater chance of being bad for us. True enough, even though the details are still unclear, nevertheless most gerontologists believe that mitochondrial mutations are indeed a major contributor to eventual age related ill health. What do we do about it? The obvious thing you might think is to somehow do mitochondrial gene therapy to get a replacement or repaired mitochondrial DNA into the mitochondria so that the mutations are nullified. It turns out that that isn’t going to work because of the way that mitochondria are maintained and recycled during life. It turns out that essentially we are running or losing battle against natural selection at level of the mitochondria. Instead of that, the approach that we’re pursuing which is an approach that was first put forward more than 30 years ago is to make modifications to the mitochondrial DNA so that we can put copies of this modified DNA into the nucleus, into our normal chromosome. The modifications are designed so that when the protein was synthesized, they are transported back into the mitochondrion so that it can do their job just as if they had been synthesized within the mitochondrion in the natural way. That terribly sounds fiction at first, but it turns out not to be nearly so hard as it sounds because the mitochondria is a really complicated machine that is composed of well over a thousand protein and all the others, all of those 13 proteins I’ve mentioned, they’re already encoded in the nucleus so that the machinery for transporting proteins into the mitochondrion already exists and it’s very generic. It just walks on anything that looks right. Whether that machinery works, that input machinery, it’s well understood. It’s been well characterized for a long time. We continue with issues within cells. The proteins and other constituents of our cells are all eventually damaged as the result of biochemical accidents that occur during normal metabolism, or simply outlive their usefulness. Cells have a variety of systems for breaking down and recycling such unwanted materials, allowing them to clear garbage out of the way and reuse the raw materials. One such system is the lysosome, a kind of cellular “incinerator” that contains the most powerful enzymes in the cell for breaking mangled molecules down into manageable pieces. However, sometimes these constituents are so badly fused together that not even the lysosome is able to tear them apart. And if something can’t be broken down in the lysosome, there’s nowhere else for it to go: it just stays there until either the lysosome disastrously ruptures, or the cell itself is destroyed. Over time, the material that the lysosome has been unable to break down accumulates inside of it, and eventually the rising buildup of such material begins to interfere with the lysosome’s function. This is an especially big problem for cells that have to last for a lifetime in our bodies, such as the cells that make up heart, the back of the eye, and nerve cells in the brain and elsewhere. And of course, when the cell’s ultimate garbage disposal system starts malfunctioning, it impairs the function of the cell as a whole. And as more and more cells become dysfunctional over time, tissue function is impaired, and age-related disease sets in. Consider what happens to macrophages, for example – the cells from the immune system that are responsible for protecting our blood vessels from being damaged by infiltrations of toxic byproducts of cholesterol. “Macrophage” means “big eater,” and these cells protect our arteries by surrounding and swallowing these toxic materials and then sending them to the lysosome, where they are thoroughly digested and their useful raw materials are released. But as macrophages consume more and more of these toxic materials, their lysosomes become engorged with byproducts they can’t break down. Eventually, they cease functioning, and either become immobilized and dysfunctional in the artery wall, or die outright. This buildup of sick and dying macrophages in the artery wall is the basis of atherosclerosis, the plaques in our arteries that are responsible for heart disease. As their numbers gradually increase over time, the injury swells and festers until it eventually bursts, spewing out clots and other materials that trigger heart attacks and strokes. Similarly, the inability of particular cells to break down their specific cellular waste products is also a key factor driving several types of neurodegenerative diseases (such as Alzheimer’s and Parkinson’s), as well as macular degeneration, which is the main cause of blindness in people over the age of 65. So, it’s very important that we find a way to clean the decades of stubborn waste buildup out these long-lived cells. What is the other type of damage inside cells? This one’s much easier to explain than the previous one because all it is waste products, molecular garbage that the cell create in the course of its normal operation and then for whatever reason, it does not have a system for breaking the garbage down or for excreting it. Whenever any type of garbage is created rapidly, evolution does create a system for either excreting as they’re breaking it down because if it doesn’t, then we wouldn’t get to be old enough to reproduce which would be not be [inaudible 00:37:40]. Some types of garbage it turns out are created really, really slowly which means that the only accumulate to a level that’s problematic for the cell and for the body by the time that people have ceased caring about us because we have already reproduced. That turns out to be vital as the driver of some of the most important and prevalent diseases of old age, not least atherosclerosis, which is the number one killer in the western world because it’s the cause of heart attacks and strokes, and also macular degeneration, which is number one, cause of blindness in the elderly. The reason why this garbage accumulates is because we don’t naturally have machinery to break it down. What we’re trying to do at SENS Research Foundation is to create exactly that machinery to essentially augment the machinery that we do have to break other things down and would like to have broader arsenal, broader portfolio or target. Rather than about that, it’s by identifying other species that can break down with target subjects of interest. 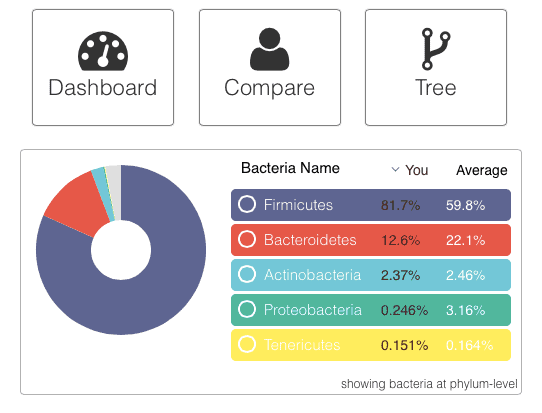 It turns out that it’s quite easy to find bacteria that can break down more or less whatever you want as long as it’s organic and that there’s energy in it. We are getting quite successful. Maybe with much as eight years ago or so we found bacteria that could break down oxidized cholesterol, which is the main driver of atherosclerosis. We started publishing on that way back then. Of course just finding the bacteria is just the first step. Then you’ve got to figure out what genes they have, the bacteria that allows them to break down the target substance. It turns out that also is not very hard. Some of the genomic techniques can address that pretty quickly. We were able to do enough to find out what genes are involved, so that’s easy. First step is the really hard one. Extracellular junk is accumulations of sticky, malformed proteins that no longer serve their function, but instead impair cell or tissue function by their presence. Extracellular junk is different from extracellular cross-linking, which is a form of damage that occurs between structural proteins and impairs their ability to move. Most extracellular junk is termed “amyloid” of one variety or another. The most well-known form of extracellular junk is beta-amyloid: the stifling, web-like material that forms plaques in the brains of patients with Alzheimer’s disease, and also (more slowly) in everyone else’s, and impairs cognitive function. There are also a variety of similar aggregates that form in other tissues during aging and contribute to age-related diseases, including islet amyloid in Type II diabetes and senile cardiac amyloidosis, which is a major contributor to heart failure. In fact, there is some evidence that senile cardiac amyloidosis may be the main cause of death in people who survive beyond age 110. What about damage outside the cell? Most categories damage outside the cell is waste products just like the last category. Again, the reason why I call that category different category is because the way to address it is different. It turns out that conceptually the way to address molecular garbage outside the cell is probably the simplest of all the seven categories because all we need to do is vaccinate against it. If you can persuade the body, the body’s immune system, that this molecular garbage outside the cell is foreign, then the very cell of the immune system will simply engulf it and get it inside the cell. Now you may think that won’t do, will it? Because you still got the problems of having bacterial genes or whatever. It turns out that actually that’s not the case. The machinery inside the cell, in the lysosome, is really, really powerful already. The machinery outside the cell for breaking stuff down is really primitive. It’s very, very poor in its [inaudible 00:44:45], which means that by and large the stuff would accumulate up outside the cell is stuff that the body already has the gene and enzymes to break down just as long as the stuff can get to a different place namely the lysosome. That’s exactly what happens when you vaccinate against it. The result is that in the case of the best known type of molecular garbage outside the cell, amyloid , the senile plaques, that are accumulating in Alzheimer’s disease. This has already been done. People have developed vaccines that can not only in mice and mouse models but actually in humans can cause the immune system to get rid of the stuff and it works. They actually do get rid of the amyloid. The clinical benefit is very variable. Usually in fact in a lot of [inaudible 00:45:30] people anyway there is basically the benefit simply because the amyloid is not the main problem that their Alzheimer’s has. Some people that have a lot of amyloid and not much in the way of other types of damage that’s happening outside this disease. Sure enough they will do benefit somewhat, but really this is a great example of why aging is complicated and the treatment of aging is just going to be pretty complicated too. It could divide and conquer a [inaudible 00:45:53] that we need. We’re just developing more therapies to address the other aspects of Alzheimer’s and when we put them all together then we can expect a very big result. All right. That’s number six. Many of the major structural features of the body are built out of proteins that are laid down early in our life, and then more or less have to last for a lifetime. They are never recycled or replaced, or are only recycled over the course of many decades slowly. The healthy functioning of these tissues relies on these constituent proteins maintaining their proper structure. Such proteins are responsible for the elasticity of the artery wall, the transparency of the lens of the eye, and the high tensile strength of the ligaments, for example. But occasionally, blood sugar (and other molecules in the fluids in which these tissues are bathed) will react with these proteins, creating chemical bonds called crosslinks. Crosslinks act like molecular “handcuffs,” taking two neighboring proteins that were previously able to move independently of one another and binding them together, impairing their function in the same way that occurs to participants in a three-legged race. In the case of the artery wall, for instance, the crosslinking of strands of the protein collagen prevents them from spreading apart from one another to accommodate the surge of the pulse being driven forward by the pumping action of the heart. As more and more strands of collagen become crosslinked together over time, the blood vessels to become ever more rigid, leading to a gradual rise in systolic blood pressure with age. With the loss of the cushioning effect provided by free-moving collagen in the blood vessels, the force of the surge of blood that is driven into the arteries by the pumping action of the heart is carried directly to organs like the kidneys and the brain, damaging to the structures that filter our blood and that connect the functional regions of our brain, and putting us at risk of a stroke. The final category of my seven point plan is again outside the cell. However, in this case it’s not molecular garbage, it’s cross linking. There is this lattice of proteins that we have it’s called the extracellular matrix. It’s all over the body. It’s a bunch of proteins that are linked together in a very regular array that’s why I call it a lattice. That regularity gives our tissues their biophysical property, in particular their elasticity. Some of our tissues it’s very important that they should be elastic in order to do their job. One example is the lens of the eye, which of course has to be deformed by the muscle around the eye in order for us to see things close up. There’s actually one type of tissue in the body where the loss of elasticity happens during aging just like in the lens of the eye where the consequence is very life threatening and that is the major arteries. In the major arteries, the stiffening that goes on is the main cause of our increase in blood pressure during life. Of course increased blood pressure causes all manner of problems like kidney failure and such like we’ve really got to fix it. We don’t want to get rid of the extracellular matrix and make the immune system think that it’s foreign or absent. We want simply to restore its elasticity. The natural way that one might think of to do that is to recycle it. To have it broken down and rebuilt periodically or incrementally or whatever. It turns out that that’s hard. It turns out that it already has developed ways in which to build the extracellular matrix that most of the time do not actually incorporate recycling it just builds one and it sits there. That of course is why it accumulates molecular changes that would use its elasticity. If it were being constantly recycled that wouldn’t happen. What we have to do is somehow work with what we have. The ideal situation is to identify drugs that can simply react chemically with the chemical bonds that cause the stiffening. Those chemical bonds are actually well understood now. We have been studying this for a long time. It’s more than 30 years since the whole concept of stiffening from the bonds was first thought of and there’s now a great deal on the chemical reactions that create these bonds and what their chemical structure is. The really good news is that the chemical structure of these crosslinks as they’re often called is very, very different from the chemical structure of anything that the body lays down on purpose. Which means that a small molecule might very easily be developed to react with these cross links and break them without having significant side effect on molecules that we want to leave alone. Of course as with everything else, if it were that easy it would have been done by now. Sure enough, it turns out that these crosslinks are actually quite hard to break, but we’re getting closer. Well, dear reader, now you have a good deal of insights about why we age and what scientists are doing about it to find interventions that replace, reinforce, remove or repair, as each situation requires. In the meantime, there’s much you can do to slow down the aging process and maintain (or regain) your vitality. I encourage you to check out the CATEGORIES (scroll up, look right) and dive into your topics of interest. Find the one thing you’re willing to do, and begin it now.